Once I trust a food brand, I stick with them. Once I know I can count on them for healthy, quality, tasty foods and snacks, I’m loyal. 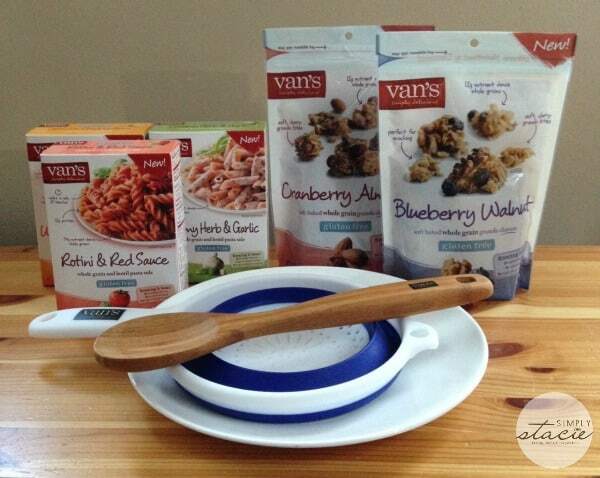 One of those brands for me is Van’s – they have proven time and time again that they know how to make healthy delicious foods, and my family and I are hooked! Van’s is dedicated to serving up what they call seriously wholesome, seriously tasty foods. They offer various delicious nutrient-rich foods that meet a growing need of dietary needs, including gluten-free, allergy-friendly, non-GMO, Kosher, and more. They’ve recently adopted a new tagline: Van’s Simply Delicious, and I think that sums them up perfectly. Van’s sent me some new goodies they’ve added to their product line, including delicious granola treats and pasta sides, along with some helpful Van’s branded accessories for my kitchen. Van’s Soft-Baked Whole Grain Granola Clusters are the perfect healthy treat for any time of day. They currently offer two flavors of Blueberry Walnut and Cranberry Almond – and I can’t decided which one I love more! These gluten-free granola snacks are filled with whole grain oats and offer 12 grams of nutrient-dense whole grains per serving. Both the blueberry and almond bags really offer up a great fruit and nut-filled flavor and just a few handfuls are quite filling, which helps curb my hunger and keeps me from snacking too much. These clusters are great for eating right out of the bag or to add in to your morning yogurt. Like everything else Van’s offers, these clusters are free of artificial flavors, colors, and high-fructose corn syrup, so you can feel good about snacking on these any time of the day and letting your kids dig in when they’re looking for a snack. Each bag has an MSRP of only $4.99. Van’s new Whole Grain Pastas make for great side dishes for any meal. 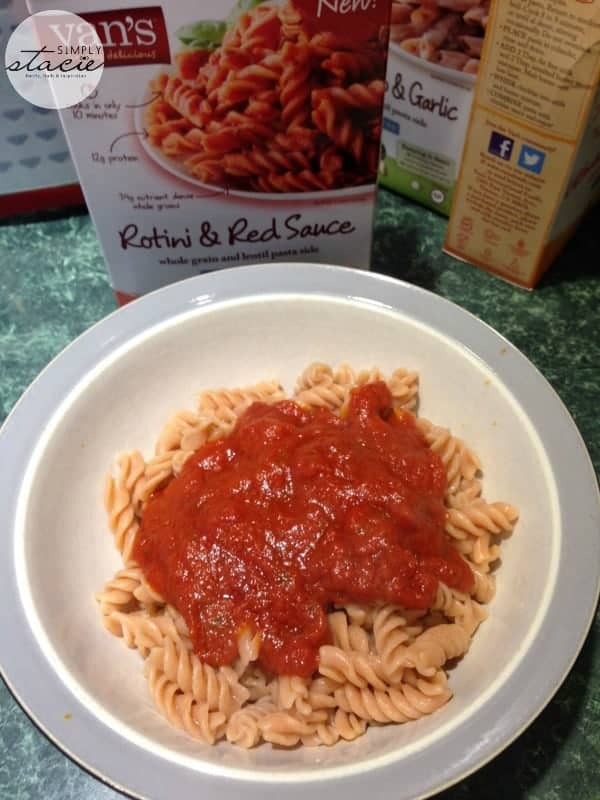 They currently offer Rotini & Red Sauce, Creamy Herb & Garlic, and Ultimate Cheddar Penne flavors. I love the texture of the pastas and the flavors are so rich and creamy. The Ultimate Cheddar Penne will be a big hit for any mac and cheese fans in your house. What I like as much as the flavors of these pastas is that each one is ready to serve in about 10 minutes! In addition to being delicious, they are a great source of protein and whole grains. Each of these pastas is made with simple ingredients and seasonings, and they too are free from artificial flavors, colors, and HFCS. Each box has an MSRP of $3.99. 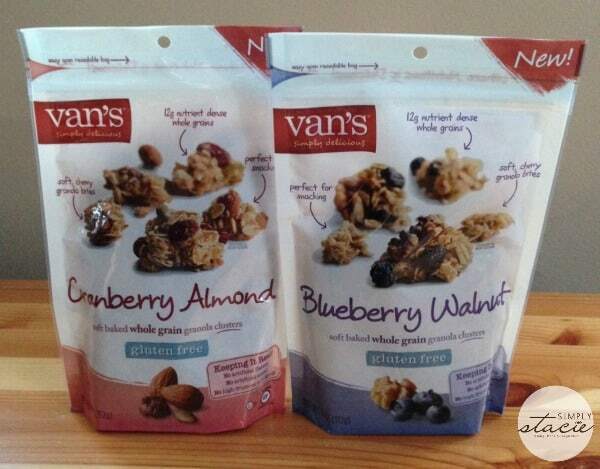 If you’re looking to adopt a healthier lifestyle, or if you already lead one but haven’t tried this brand yet, I would encourage you to pick up some Van’s products and let them prove to you that healthy can be delicious. My pantry and freezer are filled with Van’s products that my family and I love, not only for their health benefits, but also for their great taste. You can see the full line of products Van’s offers on their website. I’d like to try the gluten Free Granola Blueberry Walnut. This sounds like a delicious and healthy snack to have on the go. I would like to try the blueberry almond. I would like to try the cranberry one! i would like to try the cheddar penne pasta! Blueberry Walnut. It sounds good and I love Granola. Nacho nacho man multigrain chips! I’d like to try their Belgian Waffles – Homestyle. I would like to try their Gluten Free Strawberry & Peanut Butter Snack Bar. The blueberry walnut granola for sure!! The Blueberry Walnut is the one. French Toast Sticks Totally Original.